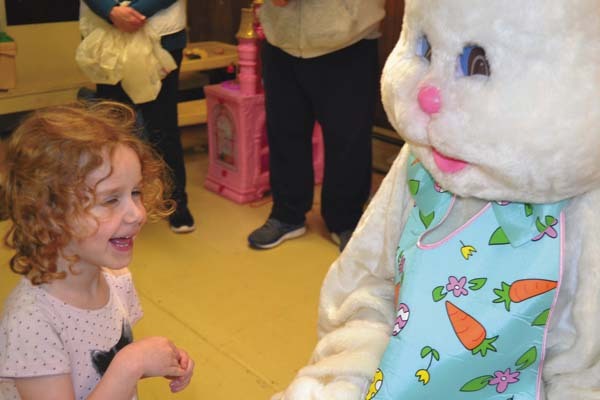 Saturday was a big day for Easter bunny-related events, and the weather was great, to boot. 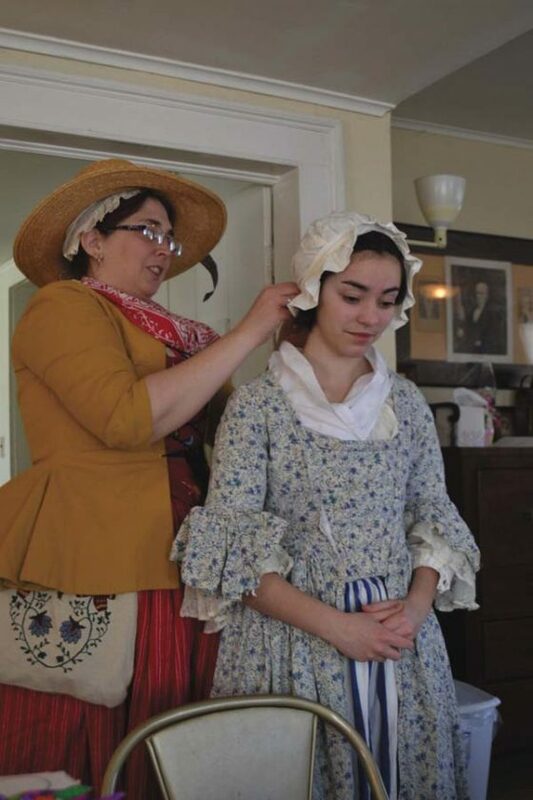 The Johnstown Historical Society had a successful Christmas event at the historic Burk Inn on South William Street, so the society held a colonial Easter program Saturday afternoon, said event coordinator Bernadetee Weaver. The staff dressed in colonial period costumes with Weaver as Mother Goose. Children who came enjoyed crafts, stories, an egg hunt and treats. One room had a former Christmas tree made into an Easter tree. Treat baskets were donated by Townsend Leather. 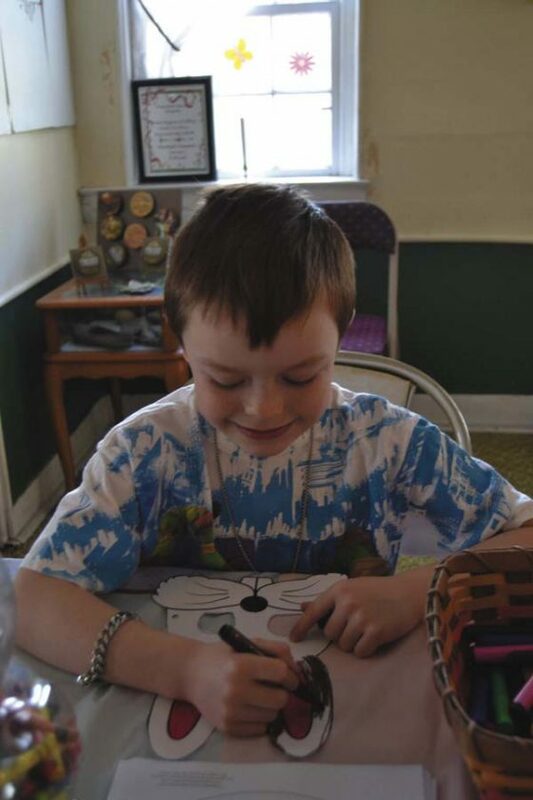 Bailey King and Pam Hammer enjoyed coloring Easter bunnies, while Jack and Ben Viscosi mastered the art of playing with the thaumatrope (Greek: “wonder-turner”)–a disk or square that can be made to spin on string. For instance, one side of a square or disk may have a bird design and the other, a cage. When spinning, the bird looks as if it’s in the cage. 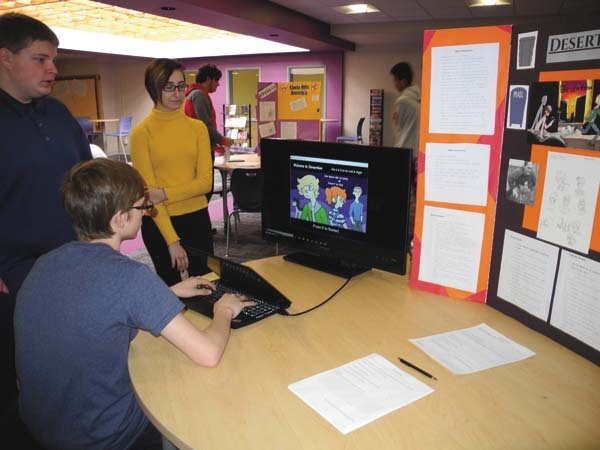 The program was a fundraiser for the historical society, which maintains and restores its museum building, Drumm House and Burk Inn. The Burk Inn is in need of a structural report on its foundation, costing $10,000 to $20,000, Weaver said. The historic Knox Mansion was also open for an Easter event, although the costuming and decor had an Alice in Wonderland theme. 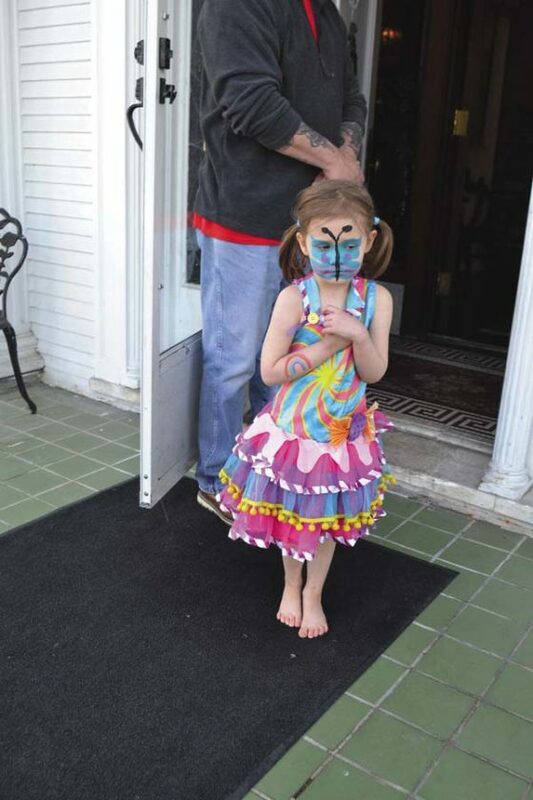 People were waiting in line to enter in groups at 1 p.m. Gracie Quinn, whose family owns the mansion and whose face was painted with a butterfly, was a kind of shy greeter. Children had arts and crafts to entertain them while adults had a gander at a 42-room mansion built in 1889 by Charles Knox, owner of Knox Gelatine, for $1.2 million. The first characters they meet are Alice and the Cheshire Cat. 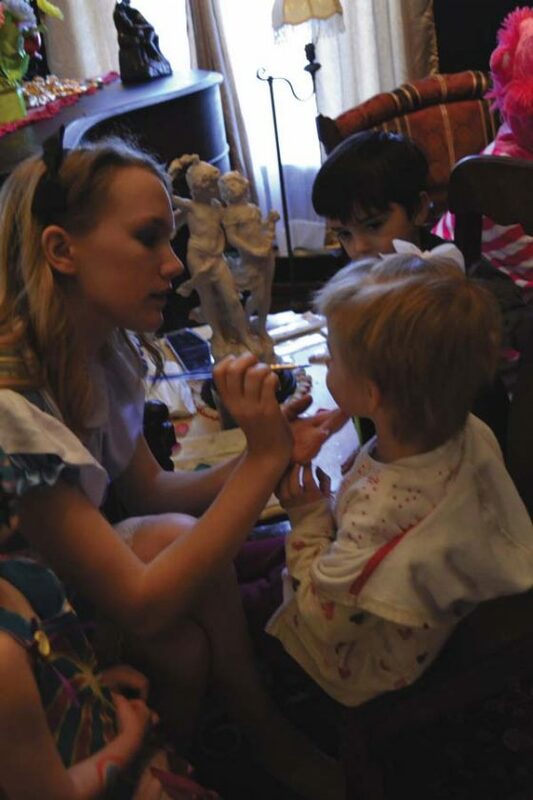 “Alice,” was Maggie Grant, also a family member, who was painting faces. 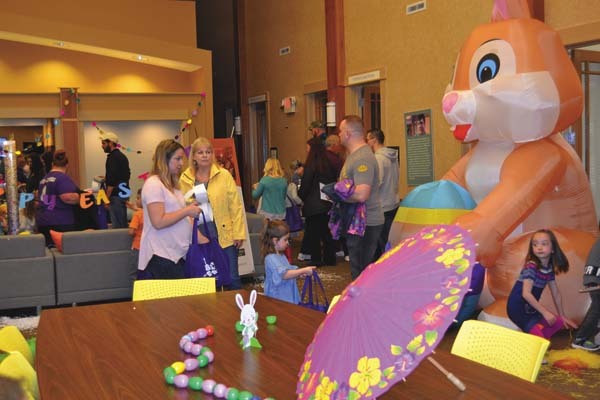 Meanwhile, the Mayfield Community Group held its eighth annual Easter egg hunt, which also included the Easter bunny, a bonnet contest, games and crafts. “I was just amazed at the number of people,” said Kevin Stangle, who helped run the event. Children had such games as ring toss, football and bean bag toss, face painting and artistic balloon making. 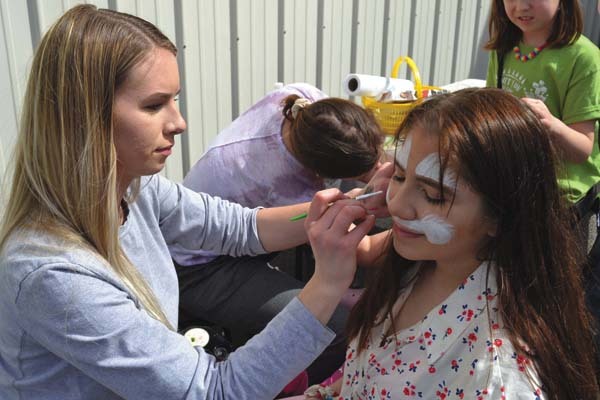 One of the face painters was Kaitlin Brubaker of Mayfield, who painted a bunny on Adriana Rose’s face. “The kids liked the Easter egg hunt,” said Brandon Trager of Mayfield, whose son Tucker was also participating in the football toss. Thaddeus Coody of Galway said his son was happy to snag the greatest number of eggs for his age group.